ATLANTA (AP) After a second loss in the Atlantic Coast Conference, it seems like a good time for Georgia Tech to reset its goals. Not so fast, said coach Paul Johnson. He’s not giving up on the idea of the Yellow Jackets (4-3, 3-2) reaching the ACC championship game, though he could’ve used some visual aids Tuesday to explain all that needs to go right. If that all sounds a bit convoluted, one thing is easy to understand. The Jacket can’t afford another conference defeat. Their part of the deal begins with Saturday’s road game against the Cavaliers (5-3, 2-2). No. 13 Virginia Tech (7-1, 3-1) travels to No. 9 Miami (7-0, 5-0) Saturday night before visiting Atlanta on Nov. 11. The Yellow Jackets close out their ACC schedule with a Nov. 18 game at Duke (4-5, 1-5). Essentially, everything has to fall in place for Georgia Tech – Virginia Tech beats Miami, the Yellow Jackets beat Virginia, Virginia Tech and Duke, and Miami loses one of its last two conference games against either Pitt or Virginia. Under that rather farfetched scenario, Georgia Tech, Miami and Virginia Tech would all finish 6-2 in the conference. The first tiebreaker would be their record in division games, which would eliminate the Hurricanes. Then, Georgia Tech would get the nod over Virginia Tech based on their head-to-head matchup. 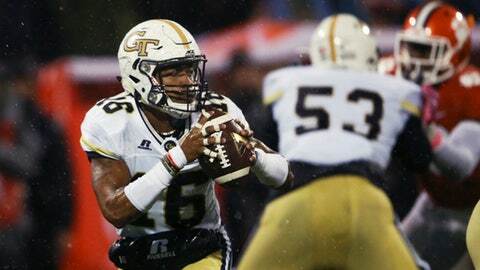 The Yellow Jackets are clinging to that faint hope. A year ago, Georgia Tech defeated the Cavaliers 31-17 in Atlanta. But Charlottesville has always been a challenging venue for the Yellow Jackets, who have lost 10 of their last 12 appearances at Scott Field dating to 1992. Marshall is eager to redeem himself for a poor showing in last week’s 24-10 loss at No. 6 Clemson. He rushed for just 23 yards on 15 carries and struggled to throw on a miserable day, completing 3 of 13 for 32 yards. Notes: OT Andrew Marshall will return for a fifth season after missing his senior year with injuries. Marshall sustained a leg injury in the preseason, then hurt a foot while trying to work his way back. Now, he’s focused on getting healthy for 2018, which would be a huge boost for the offensive line. ”We are excited,” Johnson said. ”We talked last week and he decided that he wanted to come back and play. That’s good news for everybody. I’m excited for him and excited for us.” … Freshman Pressley Harvin III is on the watch list for the Ray Guy Award, which goes to the nation’s top punter. Harvin leads all true freshmen and ranks seventh nationally with a 46.0-yard average.